One of the reasons why I love ACOF is the facility of connecting up to Squawkbox, and flying with the aid of interactive real time ATC covering most places I wish to go to, thus, providing a very ‘real’ environment. So, wanting to experience the next stage of Flight Simulation evolution, I put FSX onto my computer, I was amazed at the difference covering general graphics, the aircraft detail, and the all important vast improvement in the handling dynamics, of all the default aircraft, especially the helicopter. Despite negative talk/opinions, pre FSX from ‘experts’ that you required the computing power of NASA, I found it runs as smooth as ROLLS ROYCE Turbine, or Pratt and Whitley or General Dynamics, etc, etc… In fact I swear blind, that it actually is faster on my machine than ACOF. So, what is missing? Yup, Interactive ATC ‘chatter’. Ok, you will be saying, there is the default ATC option, OK, I agree, but, it ‘aint Squawkbox! For real interaction with ATC it was back to ACOF. Until Squawkbox is released for FSX, I thought I was to fly in realistic ATC oblivion, when using the fab FSX, but NO, Vox ATC is on the block, for us, who want more that click the mouse select options, fromm the screen, taxi take off….. We now have the option to be a whole lot more interactive, and personal with ATC, once VoxATC has been installed. What does this VoxATC offer? Putting it simply, you will get a voice recognition Air Traffic Control system, with a number of voices which you may select from, providing you with all the usual commands, covering ground and airborne instructions. Firstly, I have to admit I have not covered all the areas on offer I simply have not had the time, YET! But, I hope I can provide you with a flavour of my experience thus far. Talk to ATC using standard phraseology and receive the appropriate instructions/ information. 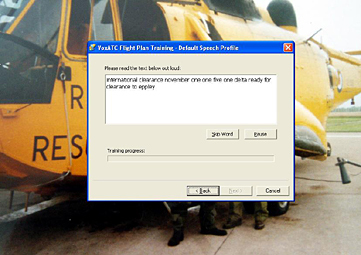 Standard UK phraseology used in UK ATC exchange; 'decimal' in frequency settings, 'pass your message' and 'ready for departure' are just a few examples. * QNH / QFE altimeter settings in millibars. * Flight Information Service units at the appropriate airports using FIS phraseology. * Air-Ground units at the appropriate airports using A/G phraseology. * LARS (Lower Airspace Radar Service). * MATZ (Military Air Traffic Zone) penetration. * Enroute emergency and urgency (pan). * DACS (danger area crossing service). 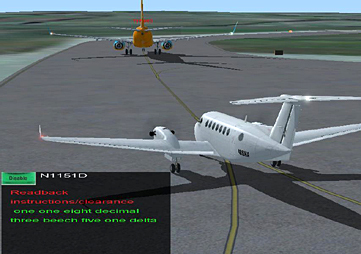 * FIR (flight information regions) providing enroute FIS (flight information service). It can be purchased as a download or cased DVD option. I selected the DVD option, again I found the entire process effortless. The instructions are easy to follow, just do what it tells you and will not go wrong. Once the installation process has been completed, which in my case was effortless, you will find the set up files, by selecting START, look for VoxATC, here you will find various setup fields, which button to allocate for transmitting and text window to appear/hide etc. One of the options will be voice selection, there will be some default options available, or some additional British voices which are excellent. You will note that there is an instruction text file, if you opt to print it, which I did, be ready with some spare paper, a lot of paper! And a replacement print cartridge, there is a fair amount of text. 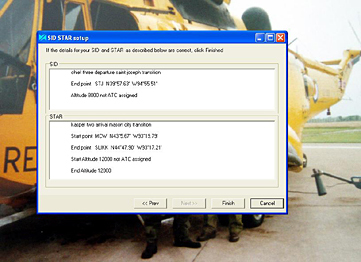 This covers Installation Selection options, and provides you with the text for an exercise/ familiarisation flight (Three) Stick with it is worth while. To make this process function, you have to able to call up the Vox ATC screen, you are prompted while installing the programme, which aircraft do you want the Vox panel installed? I opted for all, but you can be more selective if you wish. Remember, that if you install other aircraft, you will have to request the panel be ‘installed’ in the newly acquired aircraft. Once you have gone through the setup phase, which does not take very long at all, and frankly easy to follow, you are all set up to take to sky’s. To get you used to the slightly different interactive experience you can fly one of limited number of test flights. These are truly worth while. I selected one of my favourite aircraft, the C-130 Hercules positioned myself at RAF Lyneham, form the FLIGHT option select VoxATC, and hey presto the ATC window pops up! 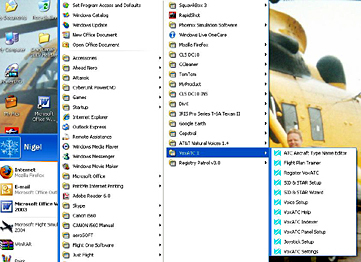 (You have the option to select the keys/buttons to call up the VoxATC window and transmit. You have a keyboard or Joystick/flight controller tag to select) click ENABLE, it takes a few seconds to connect, and then it will prompt you to select the appropriate Ground/Tower frequency. Once selected, you will hear the AI traffic, (very realistic) select your moment, quote the text that has now appeared within the VOX Atc box, and wait, by return you will get an acknowledgement!. Speak clearly and the conversation starts. If you have not logged a flight plan, the ATC will provide you with VFR based instructions, local flying options, but seeing we need to ‘break-in’ the new ‘rookie’ first officer, some nice circuits and bumps. I selected that frequency, and then proved me with all the ground and airborne instructions. It has to said, the voice recognition in this scenario was 100%. OK if you slur your words the Controller will ask for the last caller to repeat, speak clearly, and you will understood. I was able to display the Vox ATC panel in many different aircraft, (after the initial installation) which worked perfectly. In conjunction with the GPS500 in the IFR mode, the ATC instructions were bang on in terms of airspace nav aids, and location to airport. Actually, I must add, if you have two monitors, I found enlarging the GPS, after unlocking the window, to be really useful. If you do not a second monitor, no great shakes, you will still be able to enlarge it a little keep on track. 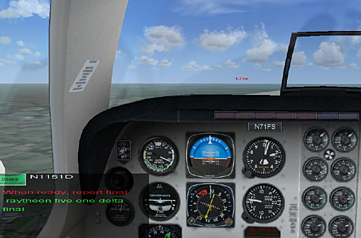 Or, if you select VFR, this will help you to navigate to your destination. It has to be said, I was amazed! It really is very clever, I do not confess to know how it works, but it does. This really will enhance your flying within FSX, as far as I am concerned, this programme is worth every penny, Ok, it is a pricy, but, Hey Ho Santa is on the way! The voices made it for me. If you use the Microsoft default voices the effect is well, comical and unbelievable, if you are a green alien form the planet Zog they will make perfect sense, BUT, the additional voice sets you get in the VoxATC UK (Expansion) & VoxATCX Plus 4 x 16 Bit Voices package are convincing. I would have preferred better quality in the ATC voices supplied, but they are passable, and believable. I understand you can obtain (for a small cost) voice sets as separate downloads from some other developers if you so desire. Ok, it does not hold the immediacy, and human interactivity of Squawkbox, (For ACOF Only at present) but, nor would you expect it to have. 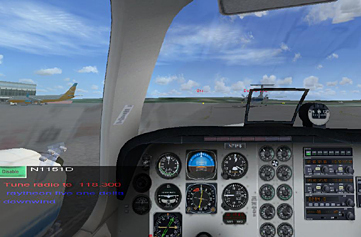 VoxATC is a product to be applauded for such an innovative piece of software, allowing the users of FSX (and ACOF) to enjoy the services of ‘Interactive’ ATC as you explore the virtual world. 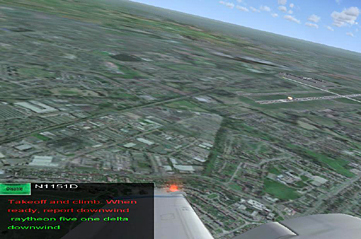 Somewhat, more beneficial the FSX user for obvious reasons. Hiccups? very few, because of the programme, you will get the occasional ‘’Last caller repeat please’’, but the recognition is quoted to be in the high 90%, my ‘’last caller repeat please’’ did not get to point of annoyance, quite the opposite in fact. I have experienced an accuracy of more like 98% /100% over many hours of use. Ok, you do not have the freedom to improvise your response, as you do in Squawkbox, (Currently not available for use in FSX) you will have to reply with the text message shown in the VoxATC box on screen, use it as, auto-cue if you wish, you soon get used to it, this process functions well. I must say I was impressed when selecting a helicopter, I was given clearance to ‘’Hover Taxi to….’’ Very nice, I do get this accurate instruction in Squawkbox, thus far anyway! Cool. A quick point of surprise, On a couple of occasions, I was given clearance to roll when there was an aircraft still on the active, and in fact when landing, but you could say this point is a little pedantic, and you would be right. I appreciate, landing on an active, or taking off, you do not want to share the space! But in all the cases, they were far enough away not to cause me a real big situation. You know, I found the interaction not only fun, but in fact instructional, during the process of flight you hear the A1 traffic and the VoxATC controllers providing professional and accurate exchange, take note, it will help you back in Squawkbox! There are other areas to this programme I have not had time to cover, but you will have fun exploring. Whilst the installation process is simple, please take care to follow the instructions, you will be prompted at various stages for a number of options, read these carefully, and you will not have any issues. 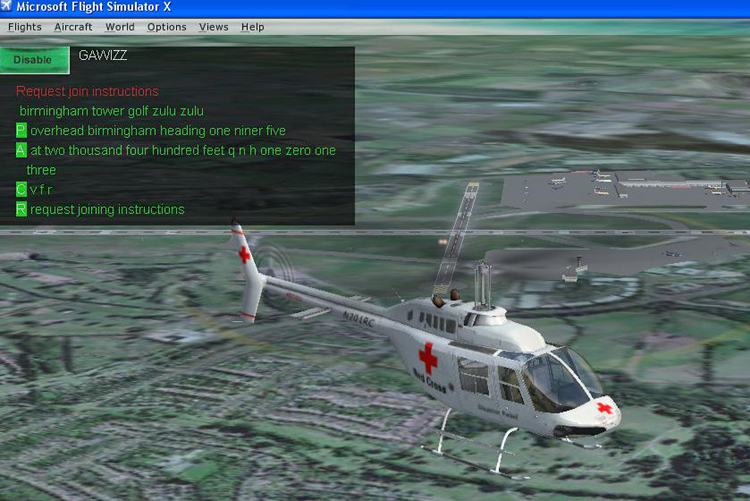 A truly innovative product, perhaps not exactly a cheap product, but provides the user with a new dimension within FSX. 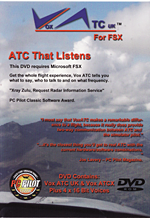 I would like to thank Bob Sidwick of RC simulations for his kind assistance in this review, and forwarding me the VoxATC UK expansion. VoxATC is available exclusively in the UK from RC Simulations, please check out our members forum for discounts on this and other products. Mutley's Hangar © 2006 - 2007 All Rights Reserved.